Luton qualified for the knock-out stages of the Checkatrade Trophy with a thoroughly comprehensive victory against League Two MK Dons this evening. In front of what was the lowest ever gate at Kenilworth Road in the Hatters' history, with just 875 turning out, beating the 897 who turned up for the FA Trophy replay with Dorchester in 2012, those in attendance were treated to another fine performance from Nathan Jones' side. The Town boss picked a strong team, nine changes from Saturday, but Glen Rea and Jorge Grant kept their place, Rea dropping to central defence, while there were run-outs for Alan Sheehan, James Justin, Alan McCormack and Andrew Shinnie, Kazenga LuaLua making his first start for the club too. Town had two excellent chances early on, an unmarked Shinnie rifling over the top from the edge of the box and then LuaLua escaping on the left to cross for Aaron Jarvis to stab wide. On seven minutes, Luton tested former keeper Stuart Moore, the stopper doing just enough to parry away Arthur Read's low effort, while Jarvis went close, not getting enough on his header from Justin's excellent cross. Read wasn't afraid to get his efforts away, sending one snapshot narrowly wide on 15 minutes. Luton then got the goal their early dominance deserved, when Shinnie was tripped in the area by David Kasumu, allowing Sheehan to hammer his penalty down the middle..
Town had a second just before the half hour, with LuaLua showcasing just why he Jones was intent on signing him. The winger stood up his man and just when there looked like nothing on, shifted the ball on to his right foot, found a yard of space and blasted into the bottom corner. After the break, MK Dons made a triple substitute and one of them, Aidan Nesbitt, warmed Harry Isted's gloves with a fierce strike. The keeper then produced a sensational double save on 52 minutes, as Nesbitt was left unmarked eight yards out, the young keeper brilliantly blocking his first effort and then somehow twisting his body to paw away the point blank follow up attempt. Town threatened what surely would have been a clinching third, as Jarvis sent Shinnie clear, with Moore denying him, while Read couldn't direct his follow up header on target. However, they were 3-0 in front on the hour mark as Jarvis escaped on the left and when Moore could only parry his effort back into the danger area, Grant nodded home. Luton could have extended their lead even further, Read going through one-on-one and hitting the outside of the post, while Jarvis was denied by a superb covering tackle. Rea skied an effort from 12 yards hideously over the bar, while LuaLua almost had a second, his low drive brilliantly tipped behind by Moore. 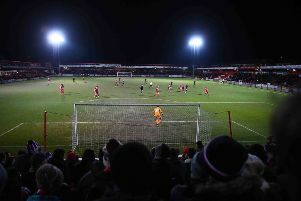 The keeper gathered Justin's 25 yarder, while Dons threatened sporadically, Nesbitt just wide of the mark, as late on, Jones brought on U18s midfielder Jake Peck came on for his professional debut, with Connor Tomlinson and Josh Neufville joining him moments later. With Brighton U21s beating Peterborough on penalties, it means the Hatters will finish at the top of the group, no matter what happens in their trip to Posh next month. Hatters: Harry Isted, James Justin, Jack Senior, Glen Rea, Alan Sheehan (C), Alan McCormack, Arthur Read, Andrew Shinnie (Josh Neufville 88), Jorge Grant (Jake Peck 87), Kazenga LuaLua (Connor Tomlinson 88), Aaron Jarvis. Subs not used: James Shea, Sonny Bradley, Jack Stacey, James Collins. Dons: Stuart Moore, Dean Lewington (C Brandon Thomas-Asante 46), Ousse Cisse (Aidan Nesbitt 46), Ryan Watson, Chuks Aneke (Alex Gilbey 46), Mitch Hancox, Robbie Simpson, Callum Brittain, Oran Jackson, David Kasaumu, Finn Tapp. Subs not used: Wieger Sietsma, Sam Nombe, Liam Sole, Charlie Pattison. Booked: Aneke 35, Jackson 71, Hancox 90, Senior 90. Attendance: 875 (MK Dons 208).